I was driving Stella to school one chilly morning a little over a week ago and noticed the evening rainstorm we had brought down quite a few branches from our old walnut tree. I moved the big ones and drove over the tiny ones, not giving much thought to crunch underneath our tires as my mind was on making it before it started to rain again. On the ride home as I rounded the bend near our house, I spotted another branch laying there in the street. I am not really sure what made this particular branch beautiful to me. I just liked the way it went this way and that, so I picked it up. At first glance, I thought it might be neat in a large vase on our dining table, but when I picked it up and held it to the sky white I decided I would turn it into a mobile for the kid’s play nook. I love the delicate features of this little craft. I did it when I had a little chunk of free time to myself in the afternoon, such a restorative way to spend my down time when I have it. I love that the light catches it and makes they space they play in each day sort of dance and glow. I think I am going to make one for each season, having the kids help me as they get older and are able to collect and make knots. Step 1: Gather your materials. 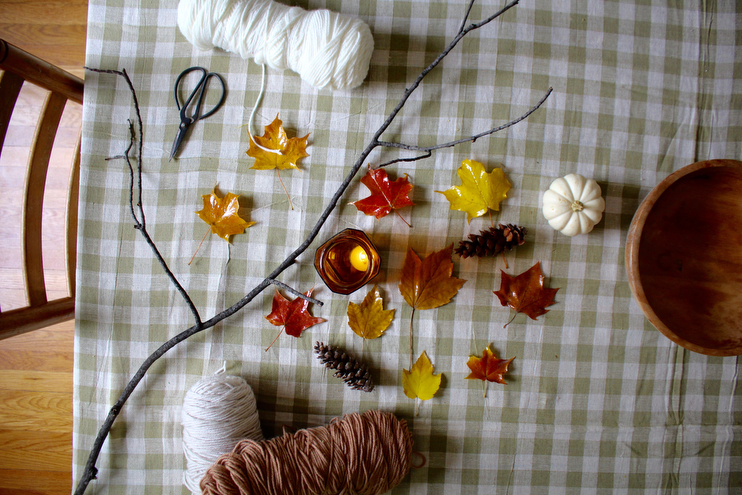 You’ll need yarn + bits of seasonal nature +beeswax OR mod podge + and a big, branchy stick. 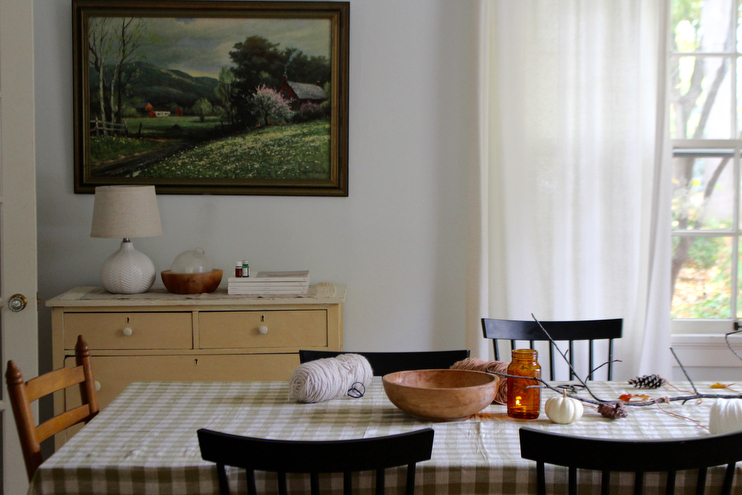 Step 2: If you’re using leaves or something you want to preserve, give them a dip in warm beeswax. If you don’t have any on hand, mod podge will work too. It’s not as environmentally friendly, so keep that in mind if you’re mindful about chemical based materials. Let them air dry. Step 3: Cut your yarn about a foot in length and tie whatever it is you’ve collected outside on at the end. Tie the other end of the string on various parts of your branch. It looks nice when you vary this and tie some pieces of yarn shorter than others. Step 4: Step four, find a place to tie three pieces of string, forming a triangle of sorts, where you can make a knot and then fasten to the ceiling. You can see the triangle in my photos here. Hang it in someplace that makes you happy. 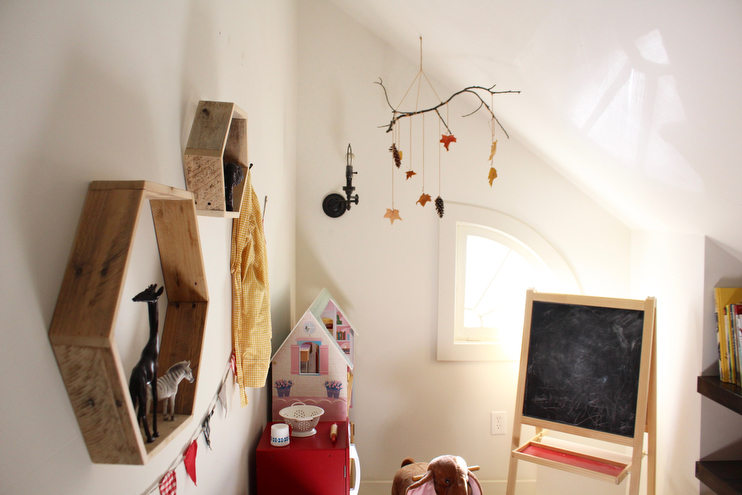 A nursery or playroom would be lovely, especially in front of a window. Let’s move onto a fun little tour of the kid’s play nook! I’ve detailed a source list below for the curious. These items are second-hand, given to us by our family or found thrifting.